Ali Ibn Abdullah Ibn Ali Jabir was an eminent reciter from Saudi Arabia. He was born in Jeddah in 1373 Hijri. While he was five, Ali moved with his parents to Medina where he had memorized the Quran at the age of 15. In 1396 Hijri, Ali Jabir joined the Sharia`h’s Faculty of the Islamic University and graduated in 1365. Fresh out, he enrolled in the High Institute of Magistracy and prepared a thesis he supported in 1400. His research was carried out in the “Abullah Ibn `Umar’s Fiqh and its impact on the Medina’s School”. 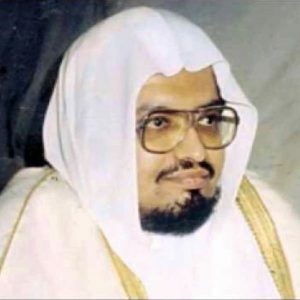 Graduated with honors, Sheikh Ali was proposed to be judge in Maysane but he preferred the position of Administrative Inspector and shortly became professor of Arab Language and Islamic studies in the Education Faculty of Medina relevant to King Fahd Abdul-Aziz University. Later on, Ali , who was imam and reciter in many Saudi mosque, was nominated Imam of the private mosque of the late King Khalid Ibn Abdul-Aziz. While the Custodian of the two Grand mosques moved to Jeddah, Ali was nominated Imam of the Grand mosque of Mecca. In 1403, Ali Jabir asked to be exempted from his functions of imam and took them back to lead evening-prayers in Ramadan’s and then as an official imam of the Mosque in the same year he got his doctorate certificate in 1407 Hijri. Sheikh Ali died in 1426 Hijri in Jeddah.